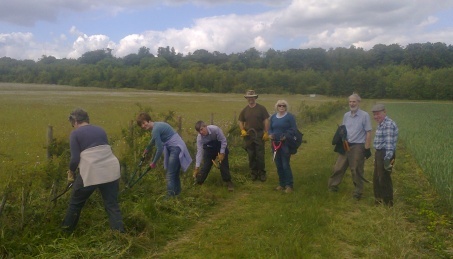 If you like practical, hands-on work in the open air, then why not join our monthly "Working Party". We normally meet on the first Wednesday of each month, convening at 2pm in the car park. Feel free to turn up any month. Or, if you would like to join the email list to have tasks and times confirmed in advance, then contact us using the form here. The long (third of a mile!) hedgerow which we planted in February 2014 on the South Down has become well established and will undoubtedly benefit the bird and plant life on that part of the Down. 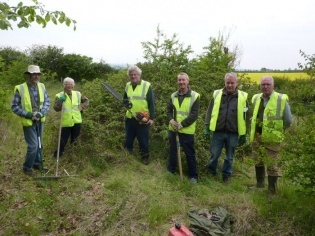 Other tasks have included controlling thistles, repairing seats, removing unwanted scrub and litter picking. See also the Recent Activities page. Cleared Blackthorn scrub adjacent to Elford Gate in Upper Memorial Wood. Cleared scrub along Upper Memorial Wood grass margin. Began cutting back encroaching vegetation along the the fence line between the perimeter path and Memorial Wood. The reasons for this are to control vigorous regrowth, recreate a woodland edge, improve access to the fence line for maintenance and to ease visitor access along the path. Weeded half the length of the new hedge (along the bottom edge of the paddocks). Once again, continued to remove scrub plants from the North Down using mattocks. "Do the volunteers still meet on the first Wednesday of the month?" somebody asked us recently. "YES!" is the answer. The Volunteer Group has been meeting most months to tackle a variety of practical tasks on the Down - here's a list of what they did. Unfortunately, while they are very good at the practical tasks, they are not so good at writing up reports of what has been done, hence the lack of more detailed 'past activities' information here since 2011. As well as the various practical tasks, we would welcome volunteer help with desk-based tasks, not least providing articles and wording for this website. Please use the enquiry form on the main Volunteering page to let us know if this is something you would be interested in helping with. In preparation for winter we started spreading wood chippings on the paths and carried out some fence repair work. Cleared strimmed vegetation from the Bowl Barrow. The plan is to cut the growth more regularly to encourage the development of a grassy sward. Inspection was made of parts of the perimeter fence that will need some repairs during the autumn. Continuing last month’s work, we tackled the middle of the North Down. Since we were further from the edges, there was less encroachment byroses and blackthorn, but lots of ragwort still blooming away. Armed with stout gloves and foot wear, and loppers and secateurs, we spread out across the North Down tackling scrubby plants and ragwort. We cut down roses and blackthorn which cause problems for the mowers, and pulled surprising amounts of ragwort. Before rain stopped play we began the task of cutting and removing the scrub saplings on the North Down before forage harvesting between 15 July and end August. We spent this afternoon cutting back new growth around the entrance gates to widen the access points to the Down. When they get overgrown, it concentrates the foot traffic and then paths get muddy, so this relieves congestion and opens everything up a bit. Another beautiful day for volunteering. We trimmed back brambles and sycamore along the fences of Magog Wood and Memorial Wood, which is done on a rolling 3 year cycle to leave the wildlife plenty of shelter. The sun shone, but the wind blew so we could not burn the brambles and we left them piled up for another day. The cowslips were just peeping out so we took care not to cover them over. thorns and had a glorious bonfire.